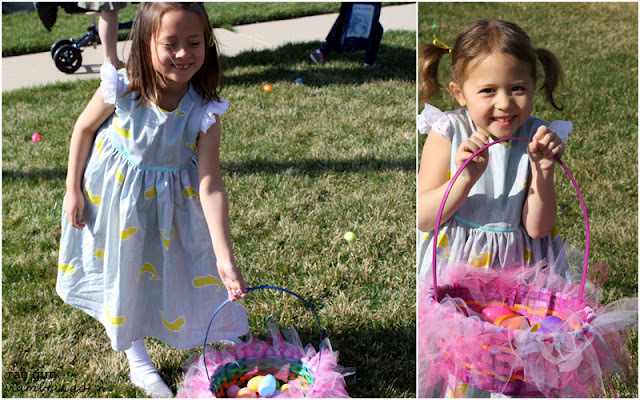 I just realized I never shared the pictures of the naughty nieces in their Easter dresses that I made them. 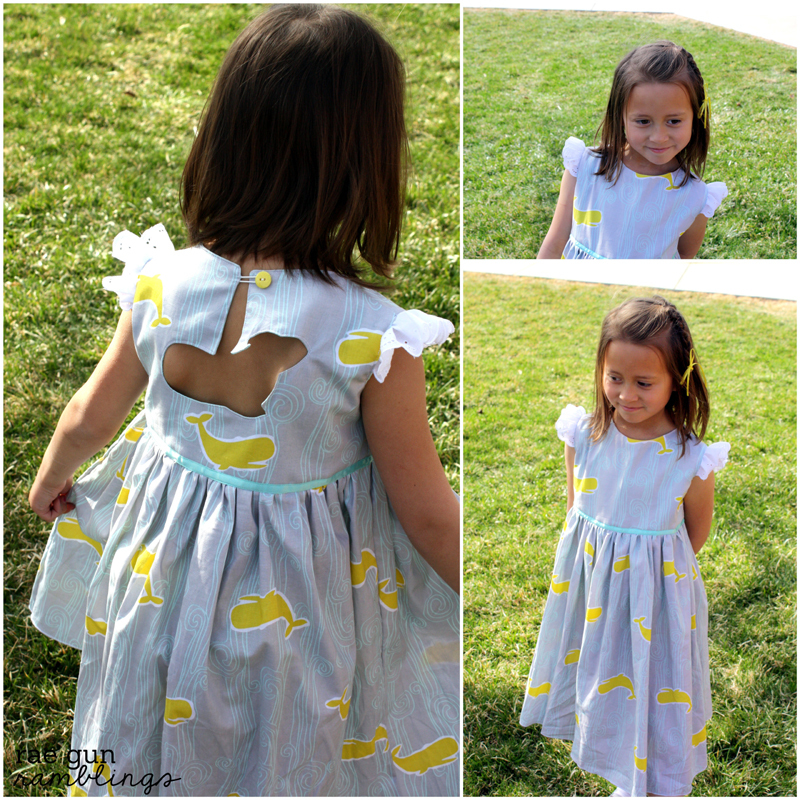 Remember those Sweetheart dresses that I made? Well the moment I saw this fabric I knew I wanted to do kind of a spin on that. I really love how the whale cut out turned out. It was so fun watching the girls chase around for eggs in them. 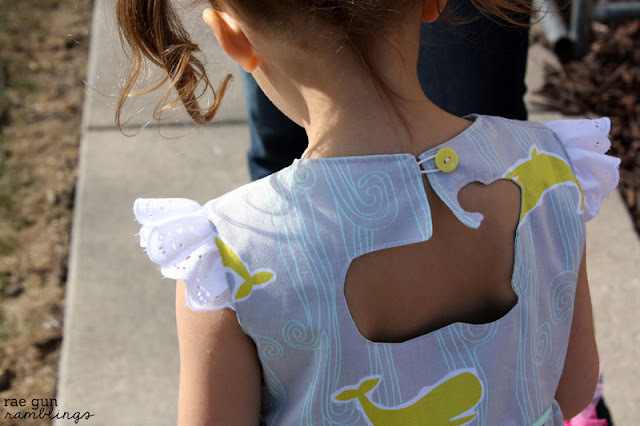 I just used the same Sweetheart dress pattern but instead of using the heart shape I traced one of the whales on the fabric. I washi taped some fabric to a window and then put a piece of paper over that to make it easier to trace. This ended up being smaller than I wanted the hey hole to be so I just drew a margin around to try to increase the size. You can make virtually any shape by doing the same thing. Keep in mind that the more simple the shape the easier it will be. Also don’t forget to snip around all the curves and points. I had to do a lot more clipping for the whale than I did for the heart. I’m not going to go into how to do all the keyhole stuff because it’s a bit complicated and Shannon does such a good job explaining I don’t think I could do it justice. Even if you don’t plan on doing the dresses the pattern is totally worth it to learn this technique. I also added flutter eyelet sleeves and I really like how it turned out. I took a couple pieces of gathered eyelet and put it between the two layers of the fabric before I top stitched the edge to close up the arm hole. I had purchased cute yellow buttons to put down the front but once I had them sewn on I just didn’t like how it looked so I snipped them off. Oh and aren’t the baskets that my sister made fantastic? All she did was tie tulle around the edge of the baskets. I can’t believe how big they are getting. Even from last Easter they just seem so much older. The dresses look great and I love that picture of you guys at the end! What lovely little ladies! The dresses turned out amazing. Oh my gosh, adorable. I kind of want one..!! Oh Marissa! I LOVE these dresses! They are so cute!!!! I love the fabric & the cutout! Those are too cute! Loved the heart dresses, but I’m impressed you can use almost any shape! Adorable! I love it! This will spark all sorts of imaginative key holes. This is SO cute! It may be the inspiration for my brother/sister outfit I’ve been thinking about for my kids. Thank you for sharing! I’d love to have you visit me at Get Your Crap Together! We have a Pattern Party with free patterns from the 1st of the month to the 10th that I’d love for you to check out. See you soon! Cute!!! I love that the hole in the back is in the shape of a whale! Too cool! what a clever idea:) normally everyone either makes a circle or heart, this is so original! I am obsessed with whales right now! I wish I had a little girl to make a dress like this for. :) So adorable! 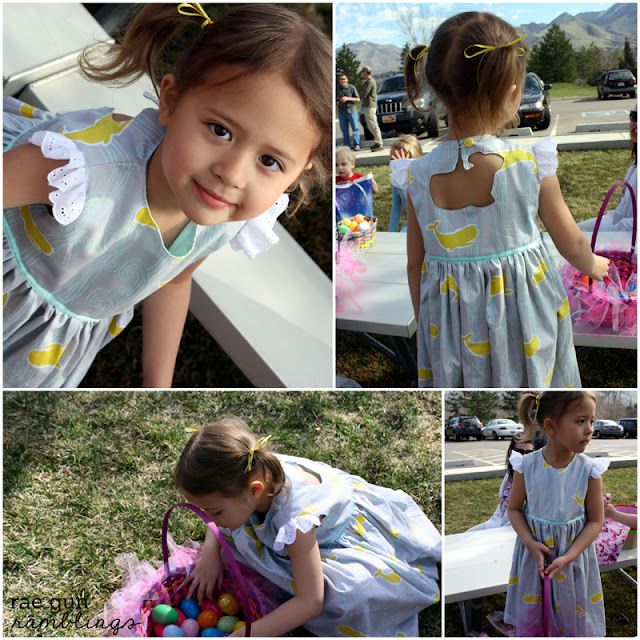 These dresses are precious! 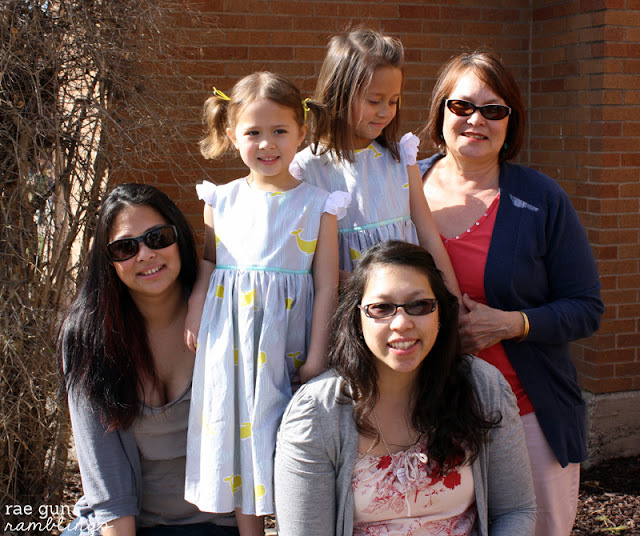 So are your nieces :) Thanks for linking up on Shine on Fridays! 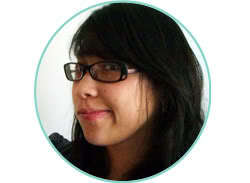 Oh so super cute!!! I love them! Amazing! I just adore that little whale on the back. So cute! Those are SOOOO adorable! It took me 4+ months to post my daughter’s bday…so you are not too late at all!